The Sun Bingo mobile app can be downloaded for free and allows players to enjoy their favourite Sun Bingo games on the go. It’s compatible with iPhones and iPads, and it offers lots of games and other great features. Read this Sun Bingo app review to learn more about the app. The Sun Bingo mobile app is designed for iPhones and iPads. It requires iOS 8.0 or later. It is also compatible with a later version of the iPod Touch. It requires 8.9 MB of space. The Sun Bingo mobile app is only compatible with iOS devices and can only be used on iPod Touches, iPhones and iPads. You must have iOS 8.0 installed in order to run the app. Those with other devices can still access Sun Bingo by visiting the Sun Bingo website and playing games there. Though bingo websites aren’t typically optimised for smartphones and other devices, you should find that the website runs reasonably smoothly. The app, of course, runs a lot better as it’s specially designed to run on smartphones and other devices. New players who have signed up to the Sun Bingo mobile app will be rewarded with a welcome bonus. It’s a match bonus that gives players free money to use on slots and bingo. To qualify for this bonus, you need to have registered an account and need to have deposited at least £10 and wagered it on bingo tickets. You will then receive a £30 bingo bonus and a £10 games bonus to use on mini games in the bingo rooms or games on the Play Slots page. The bingo bonus has to be wagered at least three times, and the other games bonus at least 30 times, before you can start making cash withdrawals. The Sun Bingo mobile app is quite easy to navigate. New users shouldn’t have any problems finding the games and features they want. How can I play games using the Sun Bingo mobile app? There’s a selection of top slots and games, as well as new and exclusive releases, that you can access right from the app’s homepage. To access the full range of games, click on the drop-down menu icon in the top left of the homepage and there will be several options: Play Bingo, Play Slots and Games. Click on Play Bingo to be taken to the bingo rooms. Click on Play Slots or Games and you’ll see a drop-down menu appear for each of them, with options such as A-Z and New and Exclusive. Select any one of these to be taken to the games. To make deposits or withdrawals, simply click on the Cashier tab near the top of the screen. You will then be able to choose from Deposit, Withdraw and Balance. Click on Deposit to deposit money into your account; you can also manage your deposit limits. Click on Withdraw to withdraw any winnings you might have won. If you want to check on your balance, simply choose Balance. Are there other apps available from this operator? There are two other apps available from Playtech Bingo: Deal or No Deal Bingo and Fabulous Bingo. Both of these are available on iPhones and iPads. The Deal or No Deal Bingo app is based on the popular Channel 4 daytime game show. 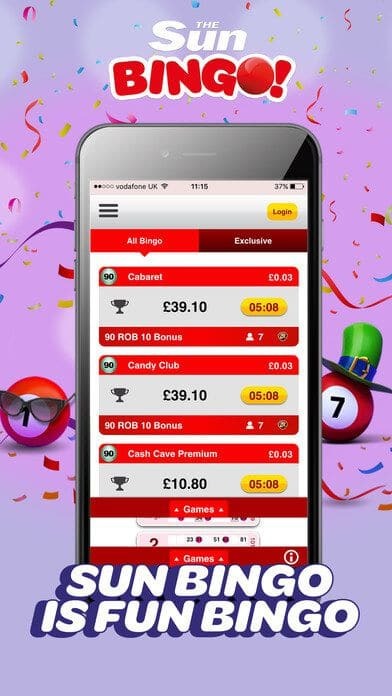 The app offers 10 bingo rooms with 90-ball, 80-ball and 75-ball bingo available, as well as a range of slot games. There are plenty of bonuses and promotions, including loyalty points, BOGOF games, 1TG and 2TG games and regular cashback offers. Fabulous Bingo is a pink-themed bingo app offering over 10 rooms with 90-ball, 80-ball and 75-ball bingo available, along with speed bingo and a collection of over 50 slots. 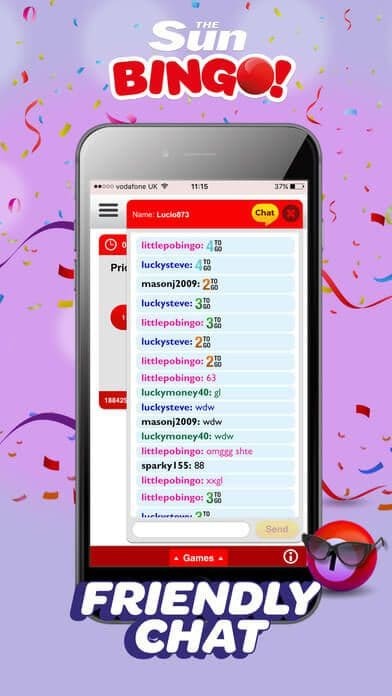 The app has plenty of promotions running, including a 300% match bonus on deposits of £10, a monthly 75-ball bingo game with a £20,000 jackpot and daily £10,000 Bingo Linx games. There doesn’t seem to be any sort of special bonus or promotional offer exclusively for mobile users. It seems that all of the promotions available to mobile users are the same as the ones available on the main desktop website. The Sun Bingo mobile app is well worth downloading if you fancy playing bingo while out and about. The app offers lots of promotions and bonuses, as well as plenty of games to keep you entertained. It’s easy to navigate and new players shouldn’t have problems finding what they’re looking for. 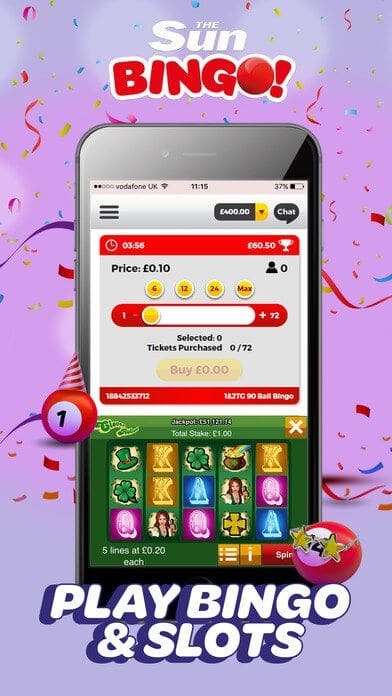 The app is currently only available on iOS devices such as iPads and iPhones, though if you don’t have one of these devices, you can still access the Sun Bingo website from your web browser. If you haven’t already downloaded the Sun Bingo mobile app, download it today. There’s a welcome bonus with £30 in bonus money waiting for all new players who sign up and deposit £10. This welcome bonus is split across bingo and a selection of other games the app has.